America’s White House and State Department’s planning of President Obama’s visit to Hiroshima, the first ever from a serving American president since dropping the atomic bomb, must have been fraught with the anxiety of a PR company trying to contain the potential fallout it was commemorating. How to communicate repentance without stirring up the toxic sludge of appearing to accept blame for what was arguably the most brutal way to end a war in human history. While Obama courageously stood and spoke movingly on Hiroshima soil, the inscription beside him on the monument read, “Rest in peace for the error shall not be repeated”. Obama’s carefully chosen remarks were free of possessive pronouns. He elevated contrition to an existential appeal, encompassing all of mankind, while speaking with the hooded eyes of experience. The “error” of Hiroshima (and Nagasaki) secured victory for the Allies on the Pacific front of WWII. It also eviscerated 180,000 people and, for others, it led to a lifetime of slow death from its nuclear impact. The absence of the word “apology” in Obama’s speech was not an absence of compassion or a shirking of responsibility, but an effort to acknowledge the calamitous effects of the event while playing down the neurosis of victimisation between two countries with a continuing, positive relationship, 71 years later. The “error” was inextricably linked to the provocation of Pearl Harbor and subsequent horrors of suffering and sacrifice for both sides, and reflected an extreme combination of the three elements of “psychology, politics and war” which historian-philosopher Stephen Pinker defines as “astronomically unlikely”. For this unlikelihood to remain astronomical, those three elements need to be perpetually diffused. Ex-UN ambassador John Bolton’s accusations that Obama was accepting “moral equivalence” when comparing degrees of devastation between Japan and America while describing his visit as shamefully apologetic, were unhelpful and unjustified. And Donald Trump’s finger jabbing should be considered no more than a weird uncle’s molestation. America’s president looked into the eyes of a Hiroshima survivor, and, by embracing him, spoke volumes about conscience, both figures knowing how impossible it is to equate in words the complexity of what constitutes national self-defence with a genuine, heart-felt desire to end forever such destructive mechanisms of pursuing it. The presence of America’s president at Hiroshima’s memorial was a cooling balm to today’s fiery rhetoric of populism and anger which is undermining the democratic process. “I am simply grateful for his visit,” said Tomoko Miyoshi, 50, weeping, who lost ten relatives in the Hiroshima attack and now watched Obama on her mobile phone. 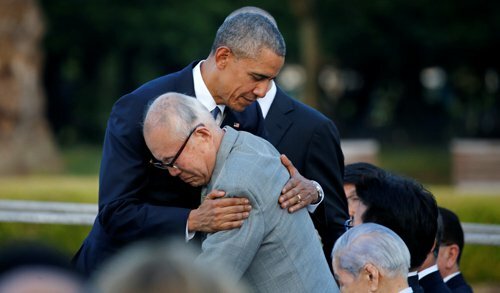 The sight of Japanese survivors standing quietly to listen to the American president was humbling. But it should also serve as a reminder that our children should not have to dust off the aftermath of any of today’s ongoing or emerging conflicts with the same stoic necessity as Hiroshima’s grandparents. Because the “War to end all wars” (WWI) engendered others, until today’s drone warfare and proxy versions have become, once again, what military writer Carl von Clausewitz described as, “the continuation of policy by other means”. In 2003, up to a million people demonstrated in the streets of London against the war in Iraq, three million in Rome, 1.5 million in Madrid and up to eight million across the world. They were ignored. It was a seminal moment marking a loss of faith in the political process, and the abject betrayal of the people by their politicians. The young walked away from their governments. One could argue that in Britain it has taken a pacifist like Labour Party shadow leader Jeremy Corbyn, to bring some of them back, 12 years later. Corbyn might be naive or unrealistic in his objectives, and downright egotistical, but so were those behind the invasion of Iraq. Pacifism does not necessarily save lives, but what should be today’s victories – the free exchange of life-enhancing ideas, services, minerals, food and environmental resources – are often still quagmired by conflict, and a Medusa’s head of terrorist insurgencies. It is easier to sell lethal military equipment to allies or punish enemies with drones and “here’s hoping” strategies than to resolve conflicts and break down barriers. Within the American federal government itself, much of what was once done by congressional legislation is now achieved by judicial decrees, security agency rules or presidential executive orders. This is fertile ground for delusions of despot grandeur. Unless we loudly condemn the feverish whipping-up of nuclear speak from Putin and Trump, what will our middle-aged children have to stand in commemoration of?